Almost all the athletes I know love two things: caffeine and protein. Many say they can live without a lot of things..but they can’t get through a day without their coffee. With new research showing that coffee is actually antioxidant-packed and has physical and mental health benefits, who needs to give up their daily cup of Joe? I drink at least one skim or soy latte daily and have never thought twice about it. I’m also always looking for high-quality sources of protein for post-exercise muscle recovery and to keep me fuller longer. When a few samples of CLICK Espresso Protein Drink showed up at my door a few weeks ago, I thought this is brilliant but I wondered how would it taste? 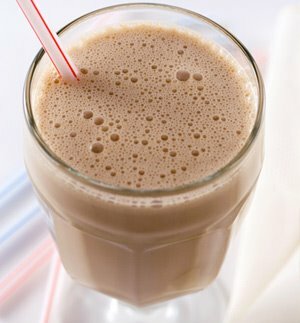 I’m happy to report here that I LOVED these protein-espresso shakes. They taste more like something you’d get at a gourmet (read: pricey) coffee shop than a recovery shake. I like them after a CrossFit workout or trail run when I’m trying to meet my post-exercise recovery nutrition needs. I’ve even had them if I’m craving something in the afternoon and have energy- and brain-drain, I’ll have a quick CLICK to revive me. Each shake provides a double shot of espresso coffee, 15 grams protein, 23 vitamins and minerals, 7 grams sugar (1 ¾ tsp) and 120 calories. You can find CLICK at Vitamin Shoppe stores across the country and it’s also available online at GNC.com, Amazon.com, among other online retailers. 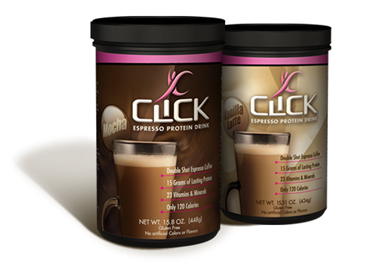 Ten winners will each receive two containers (28 servings) of CLICK, including a CLICK Mocha and a CLICK Vanilla Latte. To enter, “Like” us on Facebook and “Like” CLICK too. And, in the comments below, tell us what exercise you did today (or are going to do) that you need CLICK to help you recovery from. I’m an AFH and Click Facebook fan. I need Click because I plan to dance to a Zumba workout today. to help get me going in my workout and recovery after I complete my 4 sets of jumprope, combination boxing/kickboxing and burpee routine today. I am a fan of both pages! I need the Vanilla Late Click Protein Drink to help me get through my Funky Fit Hip Hop class!!! I liked you on Facebook and I was already a fan of Click. =] Most excellent blog you have here – I look forward to more knowledge! I’m a fan of both pages 🙂 I drank 1/2 CLICK shake before the Curves Circuit workout and then the other 1/2 on way home. I am a WLS. patient and I love Click I have it in the morning as part of my protein intake and in the evening just because I love it. I intend to use it as part of my daily routine in my weight loss journey. Thank you Click for being part of my journey. Had my Click before workout this AM to get me going! Then 1 hour cardio, 1 hour strength training and long walk with dog. May be time for some more Click! Definitely a fan of both!! My husband and I just walked for 2 hours in 10 inches of snow in this Northeastern snowstorm just to get our coffee fix because our power is out! We live at the top of a mini “mountain” so the way back was brutal on the legs, hips, and glutes. We could definitely use some CLICK to refuel!! I would love to try Click! I am did a ton of yoga today because I am going through my 200 Yoga Teacher Training. Yay! Namaste. I’m a FB fan (Mari Doug) of both. I need CLICK to help after my morning jog! Fan of both! I am an endurance runner and I run 50-Mile ultra-marathons. Today I ran my 5th 50-mile ultra-marathon and set a new PR; I finished all 50 miles in 10 hours and 28 minutes (beat my previous PR of 10 hrs and 58 min). I need a hefty dose of protein AND caffeine in CLICK for quick recovery….I could also use the caffeine in CLICK for before the race to help boost my performance and keep me going. Need the great taste in CLICK as the same protein shakes over and over get mundane. CLICK may even help me set a new PR in my next 50-Mile ultra race! Never had Click before but would love to try it!!! I drink 2 cups of coffee in the morning and I definately see Click replacing coffee! A great healthy option! As a SN RD, I would love to try Click for my athletes! I will be doing a hard interval workout tonight so could use it for myself too! I’ll be starting day 1 of the Insanity series, in addition to training for a marathon. I’m addicted to Click Vanilla Lattes!!! I’ve liked both of you! Would love to have Click to get me through my High Performer workout at Athletes’ Performance in TX! Also and SN & CPSDA member, and of course, like you on fbook! today it was a huge clean up from the weekend, but normally it would be a fantastic run around the neighborhood. I did a Jillian Michael’s cardio workout. This would be great to have either before or after. I did jumping jacks and jogged for awhile so CLICK would be good to drink. Winners of the Click Espresso Protein Drink are…. Email us at info@appforhealth.com so we can get your address.